In the early summer of 1642, on the eve of the civil war, Milton came home from a holiday in the country, bringing with him the sixteen-year-old daughter of an Oxfordshire squire as his bride. The young wife stayed with her husband a few weeks and then returned to her family, promising to rejoin him at the end of the summer. When the end of summer arrived, the civil war having in the meantime begun, she failed to keep her word. 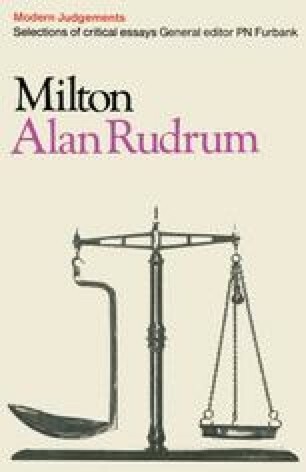 About a year after the marriage, Milton published a pamphlet of forty-two pages entitled The Doctrine and Discipline of Divorce restor’d to the good of both sexes. Six months later he issued a second edition of this work, extended to twice its original length. At about the same time he put out a second pamphlet on the subject, The Judgement of Martin Bucer concerning Divorce, and early in the following year two more, Tetrachordon and Colasterion. I shall not recount the rest of the story, what little we know of it, how his wife came back to him when the war was over, and how seven years later she died, leaving him blind, with three young daughters to bring up, with the burden of public office, and with great literary ambitions yet unfulfilled. That he fell short of satisfying the standards set for husbands and fathers by later moralists should not, in the circumstances, seem surprising. Nor should it seem strange that the legend that the mighty champion of liberty in the state was a petty tyrant in the home was relished in the hey-day of royalism and disillusion which followed the rule of Puritan saints.